One of the only computer games I ever played was called Sim City. This is the game where players build a city by adding residences, businesses, roads, buildings and react to the consequences of each of their moves. Too many houses results in traffic congestion and resident unrest, quelled only when the player adds roads and public transport or starts building in a new area. Too many roads put a city’s fiscal situation in dire straits, so the player needs to figure out how to attract more businesses that could end up putting a strain on the city’s utilities. And so on. Take the neighborhood called Lakeside, or as some have referred to it, Little Italy. This covers the area east of Park Square, down Fenn Street all the way to East Street, with the lake in its name being Silver Lake. When the first buildings sprouted up around Park Square, this area was most likely forested and then turned into farm or grazing land. The first lots were sold to English, French and African American settlers so they could walk to work in the center of town or to church. One early resident was Samuel Harrison, a 34-year-old preacher, who paid $50 for a lot on Third Street in 1852, two years after moving to Pittsfield to take up his duties at the Second Congregational Church. Later, John Crosby bought a home in this neighborhood when he moved to the town to take up his duties as county sheriff in 1868. The real impetus to growth in this area came from the Robbins and Kellogg Shoe Company that built a four-story factory on Fourth Street and immediately offered employment for up to 450 people. The company built homes and tenements to house its workers. Making shoes turned out to be a major draw for early immigrants from Italy who began to take up positions in the company. They, in turn, pulled relatives and neighbors to the area as vegetable and fruit peddlers. Another immigrant, Charles Genovese, saw a business opportunity as his neighbors had difficulty securing bank loans so he opened Banc Italia in the front of his residence on Fenn Street. The influx of Italians then spawned enthusiasm in the community for their own church, and launched a 20-year campaign to build Mt. Carmel. The first mass was held in 1924 and the church grew to include a parochial school, a parish house and a rectory. The church held the residents in place, even after the shoe company closed in 1900, but by then, new jobs were available, still in walking distance, in the new Stanley Manufacturing and then General Electric plants. New lots, houses and then multi-family units, shops and businesses, new arrivals, churches, schools, community centers. These are the cement that hold together the neighborhoods in the city and propel the transitions through the city’s history. Several characteristics became apparent during the course of the research. First, for the most part, the city’s ethnic communities intermingled in these neighborhoods. Kevin O’Hara, in his wonderful book Lucky Irish Lad, describes Halloween trick or treating in his Wahconah neighborhood, past the homes belonging to the Callahans and Horrigans, on to the Gagliardis, Douillets, Marinaros and Walczyks. In addition, we were able to find and relay the stories of nationally accomplished residents tucked away in these neighborhoods, including our well-known figures Oliver Wendell Holmes and Herman Melville over on Holmes Road, but also those who should be more well known, such as Carolyn Claiborne Park, a BCC teacher whose book, The Siege, changed the way people view autism or Alfreda Withington, who lived on South Street and was the first female member of the Massachusetts Medical Society. The acclaimed nature photographer Edwin Hale Lincoln took up duties as a caretaker on Allendale Farm and raised his family there. Further, we unearthed stories about places that surprised even some current local residents. I had a hard time finding people who lived near Fort Hill Avenue who knew there had been an actual colonial fort at the road’s intersection with West Street. Or that there were once 17 billiards parlors in the city. Or that the site of Walmart and Home Depot was once a thriving lumber yard. Finally, it also became apparent that the story of transition is not complete. Evidence of new arrivals still seeking to build new lives in Pittsfield shows up in Spanish-language masses at St. Marks’ Church on West Street or West African stores on Tyler Street. The long tradition of welcome and recognition of hard-earned livelihoods continues to contribute to the rich mosaic that sets this city apart and offers it a future. If it’s true that all politics is local, could the same be said about history? Maybe all history is not exactly local, but it does seem to be the portal through which many of us enter the past, whether it is tracing our genealogy, researching our house, visiting nearby museums, sites or roadside markers. For me, moving to a new town and exploring its history helped me learn my way around, finding out who streets were named after and poring over old maps to see the evolution of the town as if it were the old computer game SimCity. Local history became one of my social circles, where I met and interacted with professionals and lay people with similar interests. There is much that is unique about Pittsfield, Massachusetts, the largest city of Berkshire County, nestled in its rolling hills in the far west of the state. Beyond the social and the curious, did the history of this place speak to a broader view of national or international events, did it speak to current concerns? There is much that is unique about any town or city, but delving into Pittsfield’s history reveals evidence of broader national trends and developments, how decisions taken and events played out far away affected people right here at home. More than that, the history of this place may also speak to broader concerns of the present. These lessons gradually dawned on me in preparing the exhibit, “Turning Points,” on display at the Berkshire Athenaeum as part of the winter 10×10 Upstreet Arts Festival held every year coinciding with school vacation in February. Flip through any U.S. history textbook, and broad themes play out in this locale: early arrival and encounter with Native Americans, taming the frontier, rebellion against colonial authorities, industrial revolution, division over slavery, immigration and labor unrest, economic panics and technological progress, international trade and empire, the arsenal of democracy, postwar global dominance, industrial decline and loss of jobs and population. Through these developments, these turning points, Pittsfield has adjusted and adapted, evolved and reinvented itself. The city finds itself in such a phase now, seeking to shape a future that provides opportunity and enhanced quality of life for its residents. Answering the call of duty as the city turns out to see recruits march off to fight in 1917. 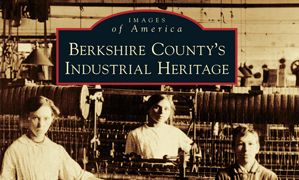 Courtesy of Berkshire County Historical Society. What strikes me about the current moment is that Pittsfield is really not all that different from many post-industrial towns and cities extending across the northeast into the Midwest. What is different, though, has been in this region’s rejection of a politician like Donald Trump in favor of his opponent. Trump’s messages of xenophobia, dark pessimism of carnage, and wild promises of jobs returning from overseas fell on fertile ground further west, but not here. What in Pittsfield’s history accounts for this difference? History tells us of multiple waves of immigrants coming to this region, instilling an ethnic pride and diversity here that makes us more likely to welcome the newcomers from Latin America and Africa in our midst. History tells of past economic transformations, from agriculture to manufacturing, from textiles to electrical, plastics and defense industries that may point the way towards openness and experimentation to find the next stage of economic growth. History tells us that proximity to New York and Boston was important, continuing to today, less as markets for goods produced here, but as a source for visitors who come here seeking cultural and outdoor escapes. Last summer, I met a young woman visiting Pittsfield from Youngstown, Ohio, and I asked her to compare the differences between these two rust belt cities. She was quick in her answer: “You have so much here. We have nothing.” A harsh statement, but a welcome one of how our home town looks to an outsider. Read an article on the exhibit in the Berkshire Eagle. What is it about passing an old mill building that pushes me off to some other world? I pause, take a second look and a third, fourth, and more, drawn in by the features of the bell tower and stairways, the small design additions to the windows, doors and roofs. Then my gaze wanders, looking for nearby streams and crossings, homes and paths. Surely, the easy answer to the appeal would be the size and sturdiness of the buildings, made of brick and stone to withstand the pounding of the machinery and the risk of fire. They don’t tower over the landscape as much as they dominate it. Aerial views and maps show just how much space they occupy in a neighborhood, easy to pick out and get your bearings, in search of an old house or store. The simple engineering behind raising such a structure had to be, in fact, anything but simple, especially without the mechanization and materials that go into modern construction. Add to that the number of mills in Berkshire County which reaches well into the hundreds, and the speed which they went up, or were later added on to and altered to make full use of new equipment. Curiosity cannot be satisfied. How did they bring the heavy iron equipment into the mills? How did people learn to operate the machinery? How were people hired and what were employers looking for in selecting the operators? How would they move one processed item completed on the second floor, up to the next stage on the third floor? How did they find their markets, and get their products to them? But the wonder of the mill really comes from imagining the stories, of the people who heard the bells, hustled along the paths, made their way to their spots at the machines, stood by them and repeated the same motions for up to twelve hours a day. I realize that I probably wouldn’t, couldn’t last a week. Ten years ago, I bought a house in Pittsfield, before I realized that my neighbor was an old mill, that a canal and reservoir that fed water to power the mill ran so close to my windows that I could hear the rushing water at night. I could likely have heard the mill bell from my window, as did those who inhabited my house 100 years ago, sending them down some path lo ng since grown over to get to work on time. All this propelled me to put together a book, of historic photos, architectural drawings and maps which give a glimpse into that world. Enjoy the dream. You can find a copy through Arcadia Publishing. Recently, I received in the mail a notice from the city of Pittsfield that, as a member of the Pittsfield Historical Commission, I had to complete my annual review of conflict of interest rules and laws. Dropping off the signed form at the city clerk’s office gave me pause: why would I, a volunteer member on a small municipal commission, be subject to conflict of interest rules and regulations, but not the President of the United States? On the one hand, it’s discouraging that it’s even necessary to remind people that service such as mine is not to enrich oneself, but to fulfill objectives on behalf of a larger community. As a public servant for almost 40 years, I have had to abide by the many conflict of interest rules and laws, such as filling out financial disclosure forms and refusing gifts over $50 from any foreign entity. On the other hand, though, I do understand the need for promoting the public’s trust and confidence in the institutions that serve them and in the people who run those institutions. The motivations in making decisions should be based on the merits of the issue at hand, weighing the benefits and costs to the greater public. We are, after all, human and susceptible to temptation, so such rules and laws are needed to draw the lines clearly for public servants. On more than one occasion over the course of my career, I had cause to refer to the Office of Government Ethics to get a ruling on situations that arose within our work. I also had good role models. Our Ambassador to Canada, and former Governor of Massachusetts, the late Paul Cellucci, beamed when he showed off the high-end driver he received from the professional golfer Vijay Singh, but he also quickly went to his checkbook to reimburse the cost of the club. Singh earned his visa renewal at the Embassy on his own merit, not on the gift of a golf club. Here in Pittsfield, it does not take much research to uncover past dealings that jar our 2016 sensibilities regarding strict separation of business dealings with public service. In the early 1800s, the first Berkshire County mill operators appealed to their Congressman in Washington, Henry Shaw, to support a tariff to raise the price of the imported goods, and help their products compete. A supporter of Henry Clay’s “American System” that included a tariff on imports, Shaw voted for its passage in 1824. The next year, Shaw (who happened to be Josh Billings’ father) took full advantage of the tariff he helped pass when he led a group of investors to buy land south of Pontoosuc Lake and build a woolen mill, the Pontoosuc Woolen Mill. The national politician Henry Clay returned the favor to Shaw whom he visited on a trip to the Berkshires that, naturally, included a tour of his mill. Thirty years later, another politician, Thomas Allen, the grandson of the Congregational minister who helped recruit soldiers during the Revolutionary War, moved to Missouri where he made a fortune as an early railroad builder, becoming President of the Pacific Railroad in 1850. The same year, he won election as a state senator and used that position to secure land grants from the state legislature for his railroad. Allen kept his ties to Pittsfield, and used some of his fortune from the railroad business to make the initial large donation to establish the Berkshire Athenaeum on Park Square in 1876. It would have been right for citizens to question whether the tariff that Shaw voted for was in the country’s best interests or Shaw’s? Likewise, was Allen serving the people of Missouri in promoting the construction of railroads or his own business interests? Examples like these led to laws enacted as early as the Civil War that made it a crime “for Members of Congress and Officers of the Government of the United States from Taking Considerations for Procuring Contracts, Office or Place from the United States.” Civil service reform followed in 1883 and, the law that set up the Office of Government Ethics was passed in 1978 in the wake of Watergate when public confidence in the integrity of government dipped to all-time lows. The new law laid out the rules and penalties relating to financial disclosure, acceptance of gifts, outside earned income and post-government employment, among others. Our incoming President-elect is legally correct in stating that the 1978 federal law exempted the President and Vice-President from the conflict of interest requirements. That exemption had more to do with concerns over restricting the President’s ability to have the full range of options in the course of carrying out his duties. The legal exemption, though, is not the same as Donald Trump’s claim that “a President can’t have a conflict of interest.” Being “legally exempt” is not the kind of statement that builds public confidence in its government and institutions. The line is blurred between his vast empire of business holdings and the decisions he will have to make on, for example, tax reform or foreign relations with countries where he conducts business. Former White House Counsel C. Boyden Gray (a Republican) agrees that “presidents should conduct themselves as if conflict of interest laws apply to them.” He was elected, after all, with a promise to “drain the swamp” in Washington, so he really needs to start by leading by example. Over the next few years, the public will undoubtedly learn more than it ever imagined about the intricacies of conflict of interest law, picking up terms like “nepotism” and “emoluments.” Unless, of course, the incoming President takes the steps needed to ensure the line between his personal assets and the public interest is not blurred. That’s the wall he should build. It’s what every public servant does. Inscription on Keeler Dam Stone Marker. Photo, the author. Of course, no iron pin is in sight, since this marker is dated November 1, 1866, a year after the Civil War ended. Another date is on the green bridge railing, speaking to an upgrade that took place in 1994, shoring up the dam, adding new barriers and stone lining to the canal and redirecting its water back to the river in order to prevent further erosion on the hillside. The 1866 marker points us back to an “old dam,” fifty inches lower. Perhaps there are other stones somewhere still to be found that indicate the 1866 dam was itself raised in 1824, 6 feet higher than the original dam, built in 1763. More than 250 years have passed since the original construction of this dam that harnessed the falling waters of the Housatonic to power the industry that drew jobs and people to the city and the region. Imagine what Pittsfield in 1762 looked like to Joseph Keeler who, approaching the age of 50, uprooted his family of ten from Ridgefield, Connecticut to settle here. Perhaps what drew him here was the news of Pittsfield’s incorporation just one year earlier in 1761 and the promise of jobs and wealth for his coming of age sons. He settled first in present day Lanesboro, and, after a year of checking out the region, he saw his opportunity on the south shore of the large lake just across the town border. He might have called it Lanesboro Pond, or the unwieldy Shoonkeekmoonkeek, but not Pontoosuc yet, since that was what the whole settlement had been called prior to incorporation. Keeler purchased over 200 acres from one of the town’s original settlers, Col. William Williams. His new plot ranged from the southernmost tip of the lake extending over 100 yards further south. There, in 1763, Keeler and his sons built the first dam, in order to power two mills he also constructed, a grist mill for grinding flour and a saw mill. In one respect, it was an ideal spot since his neighbor, Hosea Merrill ran a lumber operation taking advantage of the abundance of tall white pines, still in evidence in the area. On the other hand, it was far from ideal, since there was no road between the center of the new town and this outpost. It took four more years for another entrepreneur, Charles Goodrich, to build that road, only to receive the news that the town refused to reimburse him for the cost. Goodrich had started an iron forge downstream, perhaps taking advantage of the swiftly moving water from Keeler’s dam to fuel the bellows for heating the coal fires at the forge. He would also have needed the water as a supply to cool down the newly shaped iron pieces of saws and scythes, axes and axles for wagon wheels and other assorted metal work. From these origins, from this dam, Keeler’s mills and Goodrich’s iron forge spawned the early industry of the town. As ownership passed from these two men on to others, the advantages of the upper reaches of the Housatonic attracted still more enterprising and innovative men. Goodrich’s forge eventually became a gun shop that was sold in 1808 to another recent arrival from a Southampton Massachusetts blacksmith family, Lemuel Pomeroy. Securing a government contract, Pomeroy expanded his business to produce 2000 muskets a year until 1846. His business acumen was not limited to guns, however, as Pomeroy built one of the town’s first textile mills, on the site of yet another grist mill southwest of the town center. When Pomeroy stopped selling guns, his factory was converted into one of the largest woolen mills in Pittsfield, the Taconic Mills, whose complex stood at the corner of Wahconah and North Streets. The Keelers had unloaded their properties by 1813, selling off parcels, including one to James Strandring who set up a tool-making factory about 300 yards south of the dam. His manufacture of comb-plates and spindles for carding and spinning wool drew the inventor Arthur Schofield to set up shop in his attic. Schofield had brought to Pittsfield the makings of a carding machine that would transform the production of wool from a hand-spun, cottage industry to the heavy industrial output from the massive brick factories that dominated Pittsfield’s landscape over the next 150 years – all powered for many years by, you guessed it, water. The first upgrade to Keeler’s dam accommodated a group of investors who bought the site and Strandring’s small factory and, half-way between the two, they started the Pontoosuc Woolen Mill in 1826. This mill outlasted the ten other woolen mills in the town, which before the Civil War helped make Berkshire County the largest producer of woolen cloth in the nation, and helped attract to the region the thousands of immigrants from Ireland, Italy, Quebec, Poland and elsewhere who make up so much of our population. The second upgrade came as our stone marker suggests in 1866, at the end of the Civil War, when factories sought to ramp up their production with the new peace dividend. And the last upgrade was actually a downgrade that came in 1994, 21 years after the last woolen mill, Pontoosuc, then named Wyandotte, closed down. It’s a simple inscription on this stone marker, that hardly anyone sees. But it tells a story, our story. This also appeared in the Berkshire Eagle. You are currently browsing the archives for the Berkshires category.